Mini NEB�Industrial Humidifier.� Fully automatic operation including cleaning and drain cycles.� Comes complete with water feed hose, water discharge hose, air filter, wall bracket and suspension installation hooks.� In Stock for Immediate Delivery. Mini NEB Industrial Humidifier. Measures 12.5H" x 13.55"L x 12"W. Dry weight is 11 lbs. Imported From Italy, the Mini NEB sets the standard for localized humidification in smaller commercial settings, such as greenhouses, humidors, and wine cellars. 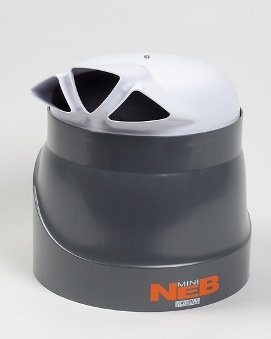 The Mini NEB drains after each cycle in order to maintain maximum hygiene. Extremely low maintenance. Must be used in conjunction with Reverse Osmosis (RO) filtered water or deionized water. Very low power consumption (23 watts). Coverage depends on humidification requirements and ceiling height. Output is approximately 0.3 gallons per hour. Designed to be either wall-mounted or suspended from the ceiling. Consider equipping with an optional humidistat. 1 Year Manufacturer's Warranty. Shipping & Handling is $34 anywhere in the Continental U.S.
Comes complete with all needed accessories (except a humidistat). Environmentally friendly; built from recyclable plastics. Requires a standard 115V power supply, water connection, and water discharge (drain). Click here for the manual or here for the brochure.